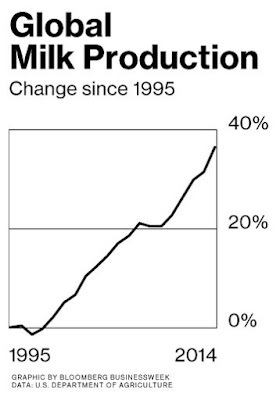 But, of course, Irish dairy farmers are 'cautious' and 'wise' and 'will gradually increase supply in response to demand'... And then there's another lesson to be learned: there is no such thing as 'collective caution' when it comes to commodities producers... so in July 2015, milk for human consumption supply in Ireland rose 8.4% y/y and butter production rose 20.8%. And in January-May 2015 (latest data available for EU-wide comparatives), milk intake by pasteurisers and creameries fell across the EU 0.1% and rose 6.3% in Ireland (second largest increase after Hungary, which has an intake of 638,000 tonnes of milk over that period against Ireland's 2,516,000 tonnes). In reality, things were even more 'cautious' on the side of Irish farmers - domestic (as opposed to imported) milk production rose 8.6% y/y in January-July 2015.